This "aggressive" hawk, photographed recently by Fairfield resident Kenneth Johnson on his Elm Street deck, may be the raptor that has resumed harassing people on the Fairfield Ludlowe High School campus. Local residents may soon be singing a tune from the musical comedy, "Bye Bye Birdie." A falconer from the U.S. Department of Agriculture will come to Fairfield shortly to remove one of two red-shouldered hawks from their nest on private Barlow Road property in hopes of ending the repeated attacks by the raptors on people at the nearby campus of Fairfield Ludlowe High School, according to Milan Bull, senior director of conservation and science at the Connecticut Audubon Society on Burr Street. "It doesn't matter which one they remove as long as the pair bond is broken," he said. Bull said he thinks one of the hawks should be placed in captivity for a year and then returned to Fairfield with the hope that both birds, together or apart, will build new nests away from populated areas. "In my opinion, it will likely solve the problem," he said. Bull said the nest is in sight of Ludlowe on Mill Plain Road, where as recently as Monday a student was attacked by one of the hawks. The aggressive behavior is unusual for this typically shy type of bird, indicating one of the raptors may have been in captivity at some point, Bull said. "It's extremely rare that they become aggressive like this," he said. The state Department of Environmental Protection contacted the federal agency concerning remedies for the attacks by the aggressive bird, Bull said. With the report this week that an aggressive red-shouldered hawk, after a month-long lull, resumed attacking people at Ludlowe, a nearby resident has come forward with photos of a raptor that may be the culprit. 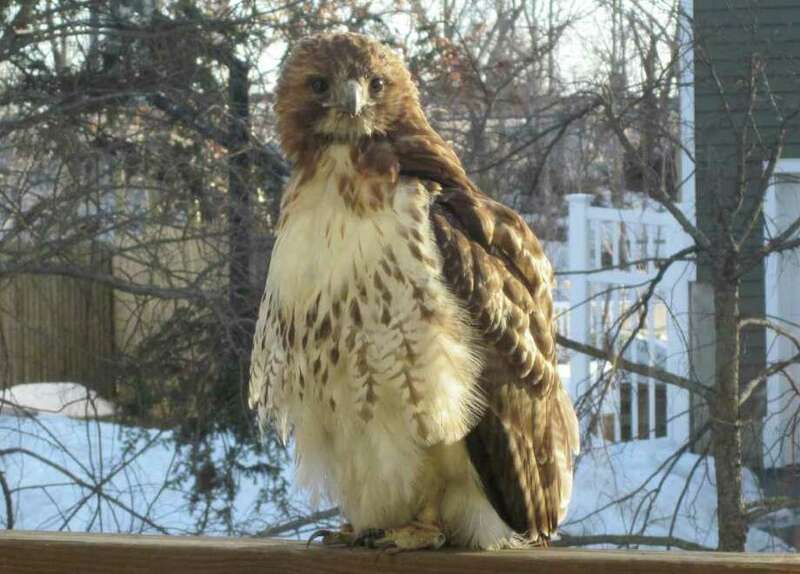 In an email to the Fairfield Citizen, Elm Street resident Kenneth Johnson said he took photos of a hawk that had perched on his home's deck last month, and that the bird "showed no fear of humans, in fact, it seemed to exhibit some very aggressive body language whenever I approached the glass. "I snapped these pictures of it, I figure that it is highly likely that this is the same hawk considering the behavior and close proximity of my home to Ludlowe," he wrote. Johnson said his three "fearless" cats stared at the bird from inside the house as a possible meal, yet the hawk was staring back at them with what probably was the same thought. "After the sighting I knew better than to let them outside with a bird that big and powerful in the area," said Johnson, who has not seen the hawk since. "I kept them inside for about 48 hours." Johnson was reacting to the Citizen's account of the latest report of a hawk attack on the Ludlowe campus, which occurred Monday when a student leaving the Mill Plain Road school was strafed as the bird dive-bombed him and inflicted two cuts to his head. The cuts were treated by the school nurse and the attack was reported to police by Ludlowe Headmaster Vanessa Reale. Officials believe the student is the fifth person to be attacked by a hawk, although they are not certain all of the incidents involve the same raptor. The series of attacks began in January, but on Jan. 28, firefighters dislodged a nest on the school grounds that officials believed might have been home to the hawk. The nest was empty at the time it was dismantled, and Animal Control Officer Paul Miller said there was no way to be certain it was built by the aggressive hawk. Those attacked include a woman knocked off the bicycle she was riding on Brookbend Road. The red-shouldered hawk is a common forest-dwelling hawk of the East and California, according to Cornell University's Lab of Ornithology. The bird can grow to 2 feet in length, weigh as much as 27 ounces and have a 42-inch wing span. This particular bird of prey, perhaps the most vocal American hawk, is known to eat small mammals, birds, reptiles, amphibians and crayfish. Its nest, often placed in the main crotch of tree near water, is usually a "large bowl" of sticks, dried leaves, strips of bark, Spanish moss, lichens and live conifer twigs.